Exercising your core muscles -- your abdominals and lower back -- comes with a variety of benefits beyond obtaining those coveted washboard abs. While the six-pack look can be a result, core exercises also can improve your posture and balance as well as making other daily activities easier. While crunches are the gold standard in core fitness, you can also work these muscles with several other activities, including resistance band exercises for your abs. 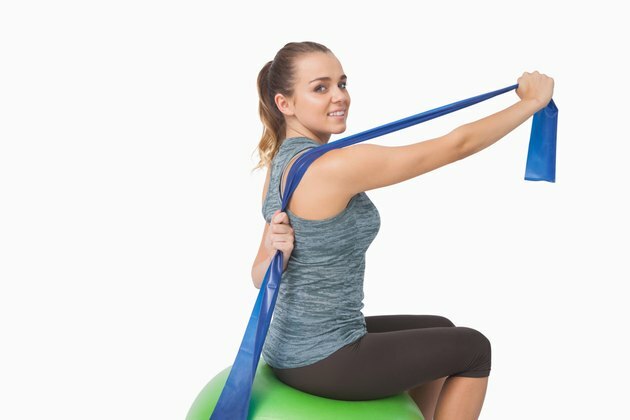 Resistance bands are a way to add variety and challenge to your strength training workouts, including your abdominal exercises. Bands are affordable and mobile, so you can take them just about anywhere. They also work for any fitness level, whether you're a beginner or are doing numerous repetitions of more advanced moves. Resistance bands engage more muscle groups, as well. Depending on the exercise being performed, the band must be held to maintain tension, which activates muscles you might not use otherwise during your ab workout. Your lower abs are at the bottom of your rectus abdominis muscles that run vertical from your sternum to your pelvis. To work these muscles with the aid of a resistance band, try a reverse crunch. Start by lying on your back on a mat with your legs raised and knees bent at 90 degrees. Your thighs should be perpendicular to the floor in this position. Wrap the band around the middle of your thighs so that you are holding the ends under your knees, with your palms facing down. Raise your head and shoulders slightly, then contract your abs to roll your hips up and bring your knees toward your chest. During this movement, use your hands to press against the band and toward your feet. Your middle and upper abs, which are just above your lower abs and closer to the sternum, make up the rest of the rectus abdominis muscle group. Work these by looping a resistance band over something sturdy, like a pullup bar, so that both ends dangle vertically in front of you. Kneel in front of them and grasp one end in each hand. Flex your hips toward the floor and contract your abs to pull the handles down as your crunch, bringing your head almost to the floor. The muscles that run along the sides of your abdomen are called the obliques, and these are responsible for helping you bend sideways and twist your body. You can use a resistance band to exercise these with a standing rotation. Secure the band so that one end can be pulled horizontally when you stand several feet from the attached end. Aim for the band to be at chest height. Stand to the side and pull the band so it is taut with just a little slack. Keep your feet shoulder-width apart and hold the band with both hands. Without moving your feet, rotate your trunk, pulling the band across your chest. Face the opposite direction to work the obliques on the other side.